The bikers are visiting two of the Balearic Islands, Minorca and Majorca, where they cook cuttlefish stew and squid salad with mayonnaise and roasted pork with tumbet. 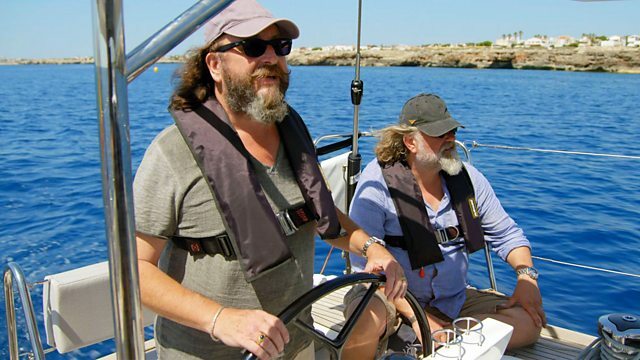 Up until now, on this epic 3000-mile journey across the Mediterranean, the Hairy Bikers have met people deeply embedded in their cuisine and culture. This time, it is about the British influence in the Med from the 17th century until today. In this episode, the bikers are visiting two of the Balearic Islands - Minorca and Majorca. They begin their journey in Mahon, Minorca. This is where one of the world's favourite condiments was invented. Yes, mayonnaise is actually Mahon-naise. Between 1708 and 1802, Minorca changed hands six times, with variously the Spanish, French and English in government. The French brought with them their traditional cuisine but there wasn't any cream here so an enterprising chef substituted olive oil in a classic French sauce. Mayonnaise was born and the rest is history. After a quick trip to the market to sample some tasty snacks, the bikers buy cuttlefish and squid for their first cook - cuttlefish stew and squid salad with mayonnaise. Upon landing in Majorca, they cook up their next Balearic-inspired dish - roasted pork with tumbet (a sort of ratatouille with a potato topping). Majorca has been a top destination for the British holidaymaker for decades but it is also a place where Britons have settled. Si and Dave meet a group of women who have made Majorca their home. As the bikers find out first-hand what it is like to live here, they cook a coca mallorquina - a sort of pizza base with fresh vegetable topping. As this group of keen cooks extol the quality of Majorcan produce, they single out one in particular - the almond, available in huge quantities here. Featured dishes are cuttlefish stew and marinated cuttlefish with mayonnaise, ensaimadas with almond filling and roasted pork with tumbet (Mallorquine ratatouille).